Living a Fit and Full Life: Hop into Spring with New Nestlé® SweeTARTS® Easter Basket Gifts, Snacks and Treats for the Whole Family! Hop into Spring with New Nestlé® SweeTARTS® Easter Basket Gifts, Snacks and Treats for the Whole Family! Nestlé® SweeTARTS are definitely some of my favorite candy around! Nestlé SweeTARTS are perfect anytime of year but I love SWEETARTS Soft Bites Bunnies, Sour Bunny Gummies, Chicks, Ducks & Bunnies and Soft & Chewy Ropes because of their adorable spring packaging. They're not only delicious but also incredibly cute. I'm not a huge fan of chocolate so I love that these Nestlé SweeTARTS are fruity flavored and contain no artificial flavors. SWEETARTS® Soft Bites Bunnies are great for younger kids because they're easy to chew while the Sour Bunny Gummies are great for those seeking a tongue-twisting pucker. 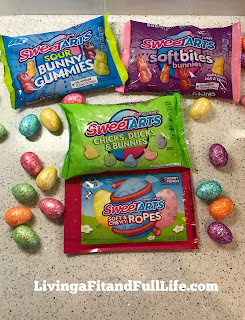 SWEETARTS® Chicks, Ducks & Bunnies remind me of the classic SWEETARTS candy that I grew up with and SWEETARTS® Soft & Chewy Ropes are my abolute favorite. I love the chewy fruity flavor with the yummy fruit punch filling. Nestlé® SweeTARTS are perfect for Easter baskets and spring time celebrations and will surely put a smile on anyone's face!